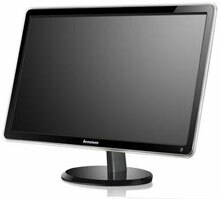 The Lenovo LS2421p Wide is a 23.6"Full HD LED TFT Monitor which adopts the latest W-LED backlight technology and provides great display quality and saves power consumption up to 40% compared to previous product. The LS2421p offers digital visual interface (HDMI1.3). It comes in a high gloss ID, transparent bezel, touch OSD buttons. It also has high display performance, such as 10M: 1 high dynamic contrast ratio and Novo Vision, and a 4port USB hub. The Lenovo LS2421p Wide is packed with green features including Mercury free by adopting white LED backlights, arsenic-free glass, and is Energy-Star 5.1 and TCO Displays 5.2 compliant.